Chloe Kim smiles after landing the second-ever perfect run in snowboard halfpipe history. It was a poignant scene at the bottom of the Park City halfpipe last weekend at the U.S. Snowboarding Grand Prix. Standing there with a big smile on her face was Kelly Clark, who 14 years ago hoisted her Burton snowboard in the air as an 18-year old Olympic champion. Today, Clark was hand-in-hand with young Chloe Kim, holding her hand on high, celebrating Kim’s perfect score victory to close out the 20th straight season of Grand Prix halfpipes. The Park City pipe has played a pivotal role in the history of the sport. In addition to Clark’s 2002 Olympic gold, Ross Powers led Team USA’s podium medals sweep in 2002 that vaulted snowboarding into the public spotlight. In 2010, the Grand Prix finale there sent Shaun White on to his second Olympic gold. For 14 years, Clark has remained the evolver of her sport and its greatest champion now with three Olympic medals, eight U.S. Open crowns and seven X Games titles, not to mention her string of 16 straight major events wins in the 2011-12 seasons that may never be eclipsed. She took women’s snowboarding literally to new heights, setting a standard for amplitude and becoming the first to successfully debut a host of new tricks to win major titles. Today, though, was Chloe’s turn. 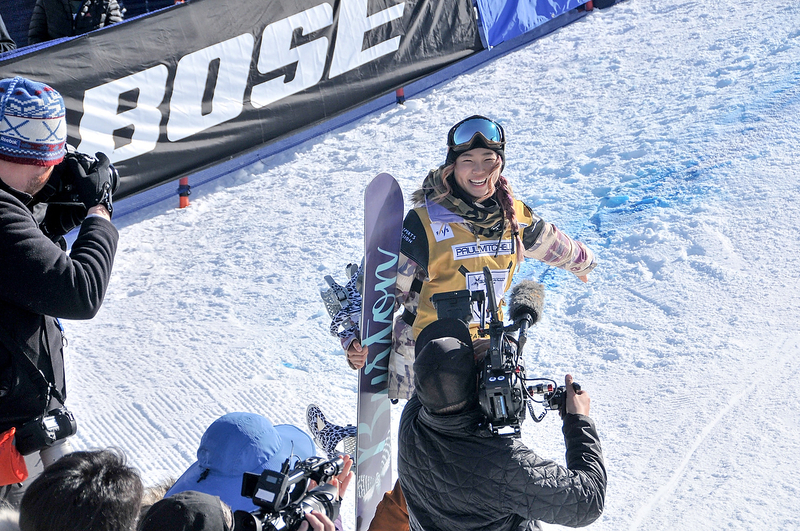 At just 15, Kim already has back-to-back X Games wins. She’s headed off this week to the Youth Olympic Games followed by the European X Games in Oslo, and has PyeongChang firmly in her sights — the homeland of her Korean parents. On the surface, Chloe Kim looks like many other teens — a bubbly young girl with a cool purple streak in her hair. But underneath, she’s about perfection and trying things that snowboarding girls just don’t do. As a teenage girl, she may not be thinking about her legacy — but she’s establishing it. If you watch her runs closely, she holds her board grabs longer than anyone. Her bag of tricks also includes a switch backside Method (meaning she’s going backwards and backside) — something only a few guys can do well. Five years ago, Clark pioneered the frontside 1080 (three rotations) in winning X Games gold. Last weekend, Chloe Kim doubled that up, becoming the first woman to ever land back-to-back 1080s in competition. After putting down a seemingly untouchable 96 on her first of three runs, she asked her coaches if she could try the back-to-back 1080s. She had landed them in X Games practice, but had never had the chance in competition. With a 96 in the bank, she was greenlighted. On the second run it was ever so close, but she fell. Between runs, Clark grabbed her fellow competitor for a little mentoring. Then came history. Kim dropped into the 22-foot pipe for her final run under bluebird skies — the sidewalls packed with fans. Each hit was huge and perfect. As she neared the bottom, she threw the first 1080 with huge amplitude, much to the crowd’s delight. As she pointed her board backwards through the flat bottom, riding up onto the opposite wall, the crowd was now in disbelief as she soared out of the pipe for a second 1080. And while the crowd came to digest what it had just seen in the back-to-back 1080s, the judges stunned them even more with a perfect score. It was only the second perfect 100 in history, matching Shaun White’s 2012 X Games run. Ever so humble, Kim set aside the hyperbole of a perfect run to focus on what was most important to her. "I’m really appreciative of the hype but I know that run wasn’t 100," said Kim. "I had four hits! I don’t really care about the score at this point — I was just happy to put that run down. It’s crazy because I know that Kelly was definitely going for the back-to-back 1080s but I’m stoked I was able to come out here and feel confident on my Cab 1080 and just be able to throw it down on my third run." History will dictate the depth of Chloe Kim’s legacy. Right now she’s just a 15-year-old girl having fun and moving her sport forward, all under the watchful eye of her sport’s leader Kelly Clark. "I’m just so stoked I was able to put that down in such an amazing place."